Available as both a day trip or 2 day trip option, this trip is perfect for the wildlife enthusiast and the avid photographer. 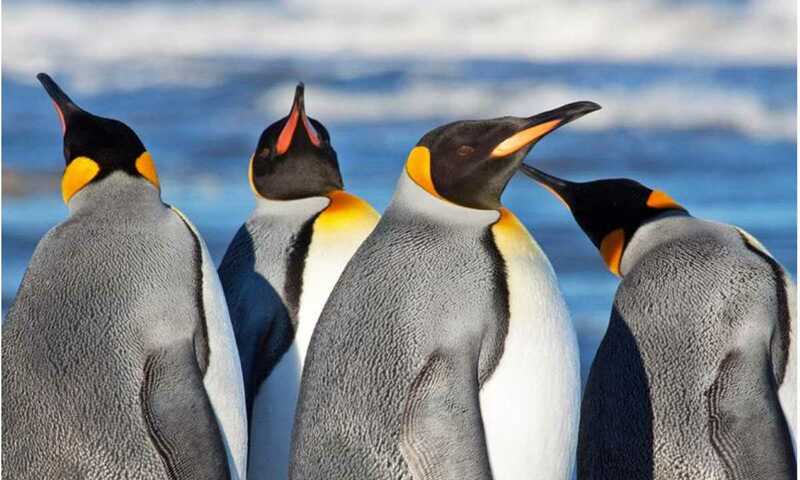 Get up close with the King Penguins and discover other sea wildlife. Fly/sail across the Magellan Straits, with sightings of wonderful sea birds. 2 hour drive along the coast to see the penguin colony. 2 day option: additional morning visit to the colony, to enjoy the wonderful photography conditions. Available on Tuesdays, Wednesdays, Thursdays & Fridays. We start our journey with a transfer from your hotel to the Punta Arenas airport; from here we will take an early flight to the town of Porvenir, in Chilean Tierra Del Fuego Island. This is a short but truly scenic 15-minute flight over the mythic waters of the Straits of Magellan. We will appreciate the incredible glacial action recorded in the last 12,000 years, which has carved these famous seaways as well as the coasts of both the mainland and the huge island of Tierra del Fuego. From the plane we will see the distant peaks of the Andes, located in the southern part of the island, and the huge embayment called Bahia Inutil (Useless Bay). As soon as we land you will realize that the vegetation of this part of Tierra del Fuego is dominated by flat wind-swept steppes, with tussock grasses and low shrubs, and interspersed with rolling hills. After meeting your local guide and driver, we will stop at the town of Porvenir, visiting a pioneer home, our lovely and cozy hotel, Hosteria Yendegaia; here we will have coffee or tea, snacks, and will have the opportunity to relax for a short while. Immediately we will be driving for approximately two hours along the shores of Bahia Inutil (Useless Bay), where we expect to see a great array of wildlife including Guanaco, Southern Grey Fox, the ubiquitous Upland Goose, Chilean Flamingo and a great diversity of waterfowl and shorebirds. At sea we may see albatrosses, petrels, gulls and skuas patrolling the turbulent waters of the bay. At 'Parque Pinguino Rey' we will have a short introduction on how to visit and approach the King Penguins. This is a private nature reserve which aims to preserve the small numbers of the 'Kings' that visit the area and even remain year-round here, taking advantage of the excellent feeding conditions of the surrounding seas. We will have ample opportunities to observe and photograph the penguins from a reasonable distance (maximum approach distance will be given by the guide and must be respected at all times during your visit). After this great wildlife experience, we will return to Porvenir to take our flight back to Punta Arenas. Available only on weekends; from Saturday to Sunday. We will start our journey with a private transfer from your hotel to the ferry docks located at the northern end of Punta Arenas. At approximately 9 am, we will begin our 2-hour crossing through the mythic waters of the Straits of Magellan; these world-famous seaways are very rich in terms of history of exploration. Magellan, Drake, Cavendish, Bougainville, Fitz Roy and Darwin, among several other sailors and explorers, surveyed this region, most of the times, in really harsh and dangerous conditions. You will see an interesting array of seabirds, including Black-browed Albatross, Southern Giant Petrel, Southern Fulmar, Imperial Cormorant, Dolphin Gull and South American Tern. It is very likely to see interesting marine mammals such as pods of Peale's Dolphin and inquisitive South American Sea Lion. As soon as we land you will realise that the vegetation of this part of Tierra del Fuego is dominated by flat windswept steppes and rolling hills, with tussock grass and low shrubs. After meeting your local guide and driver, we will stop at the town of Porvenir, visiting a pioneer home, our lovely and cozy hotel, Yendegaia House; here we will have coffee or tea, snacks, and will have the opportunity to relax for a short while. Immediately we will be driving for approximately two hours along the shores of Bahia Inutil (Useless Bay), where we expect to see a great array of wildlife including Guanaco, Southern Grey Fox, the ubiquitous Upland Goose, Chilean Flamingo and a diversity of waterfowl. At sea we may see albatrosses, petrels, gulls and skuas patrolling the turbulent waters of the bay. Parque Pinguino Rey is a private nature reserve that aims to preserve the only known continental King Penguin colony. We will have ample opportunities to observe and photograph the penguins from a reasonable distance (maximum approach distance will be given by the guide and must be respected at all times during your visit). Overnight at Yendegaia House or similar, Porvenir (Breakfast, Lunch, Dinner) (Guide). We will have the unusual chance of visiting the penguin breeding colony again during the morning, in order to enjoy of other light conditions (sunrise from the east). This is a great opportunity and an appealing one for serious nature photographers and people looking for more field time with the penguins. Most of the regular penguin tours spend merely 1 (up to 2 hours) in the colony and we will enjoy of more private time watching and documenting these incredible and colorful seabirds. After lunch we will be heading back to Punta Arenas by ferry. This trip can run as a group trip, with prices starting from $360 per person for a complete group. If you are looking to join a group or you are a solo traveller we will help to form likeminded groups of travellers. Please let us know your travel plans. Single supplement of USD $25. Trips can run for 2 or more people at a higher price, please enquire for more details. Laundry, telephone calls and anything else of a purely personal nature.